vana von der Blauen Welle is a beautiful female with a large feminine head. I bought co ownership in 2016. We bought vana to better our Rottweiler kennels breeding program. Vana was V rated at the 2017 ADRK hungarian Klub Sieger. Vana is a multi Champion female from Serbia. 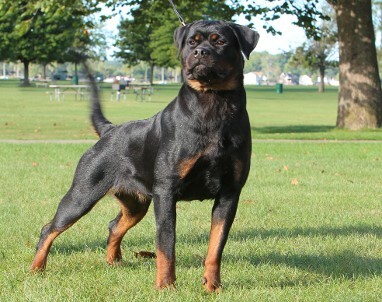 Vana arrives to USA this June to breed to our top Rottweiler stud male Ajax von haus Drazic. Planned breeding is in September. Graze was born in Bosina at the haus of Lazic kennel. Grace is a very Large female. She is 12 months old in the photo. She is currently 18 months old and will arrive to our kennel in a few months. Young class V1, Junior BOB, Junior BIS!!! Young class V1, Junior BOB, BOB, BOG, R. BIS!!! Baracuda is a large youth at only 11 months in the Photographs. Outstanding structure and head type at her age. She should receive her final V1 in Europe to make her a youth champion. In 2015 we will be breeding her after her hips have cleared to a top stud male in Europe. Nicky is only 18 months in this Photograph. She has a beautiful body with amazing structure and muscle. She has an amazing temperament. Her ball and prey drive is over the top crazy and produces top puppies for working and schutzhund. The main traits in a Rottweiler puppy come from the Rottweiler female dog. Our Rottweiler females are from 100% German bloodlines. 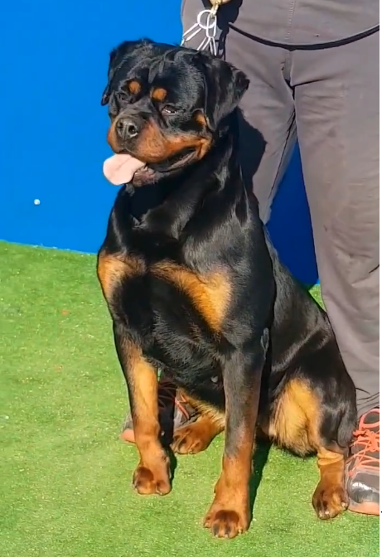 As Rottweiler breeders, we only choose females with large block heads, robust chests, excellent conformation, and sound temperments. Our Rottweiler females produce exceptional Rottweiler puppies for pet or show homes. Female Rottweilers that produce quality puppies need a little longer loin, and wide spring of rib to fit the puppies. Rottweiler females are allowed to have 15% longer loin. The more room the better to fit the growing Rottweiler pups. 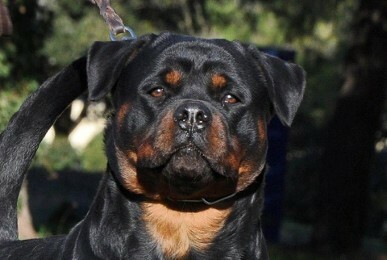 Our Rottweiler females must be stable, with very high confidence, good conformation, and high prey and ball drive. Each Rottweiler female in our kennel was selectively picked from thier litter for these traits. As a Rottweiler breeder, we try to choose the best Rottweiler puppy for our foundation kennel building dogs. The German Rottweiler for sale we offer have repeatedly proven to be smart, loveable, show stopping Rottweiler puppies. Occasionally we have a female Rottweiler for sale that may return to our kennel because the owner cannot keep the dog.